A Little Inspiration . . . and you may win a BERNINA 350PE! In November, BERNINA of America partnered with Coats to announce a Block Challenge using Coats Eclectic Elements by Tim Holtz fabric. A simple 12″ x 12″ block is all you need to create to be entered to win one of 24 fabulous prices, including the Bernina 350 PE. NOTE: This contest was conducted in January 2016 and has ended. If your creativity needs a bit of inspiration, look no further. Coats’ Rail Fence Pincushion is a quick and easy make, perfect for getting inspired to make a 12″ x 12″ block. Instructions for the project download can be found at the bottom of this post. As a reminder, here are details of the Challenge for you to savor and consider. Now through January 11, 2016, post on the Make It Coats Facebook page your 12” x 12” block made from Tim Holtz’s Eclectic Elements fabric. Be sure you hash tag your block #TimHoltzEclecticElements and #BerninaUSA. Tim and a team of experts will select 24 of their favorite blocks. Winners will be announced on the Make It Coats Facebook page on January 22, 2016. The chosen blocks will then be sewn into a quilt which will be featured at the Spring International Quilt Market in Salt Lake City in May 2016. Best part, your entered block could win one of our 24 fantastic prizes! Top Prize: BERNINA B 350 PE Sewing Machine and 10 yards of Coats Eclectic Elements Tim Holtz fabric. Runner Up: 10 yards of Coats Eclectic Elements Tim Holtz Fabric and Coats Dual Duty XP® All-Purpose thread, 50 pc. gift box. Second Runner Up: 5 yards of Coats Eclectic Elements Tim Holtz Fabric and Coats Dual Duty XP® All-Purpose thread, 18 pc. thread kit. 4th – 24th prizes: 1- 5″ Coats Eclectic Elements Tim Holtz 25 pc. Charm Pack or 25 pc. Design Roll. 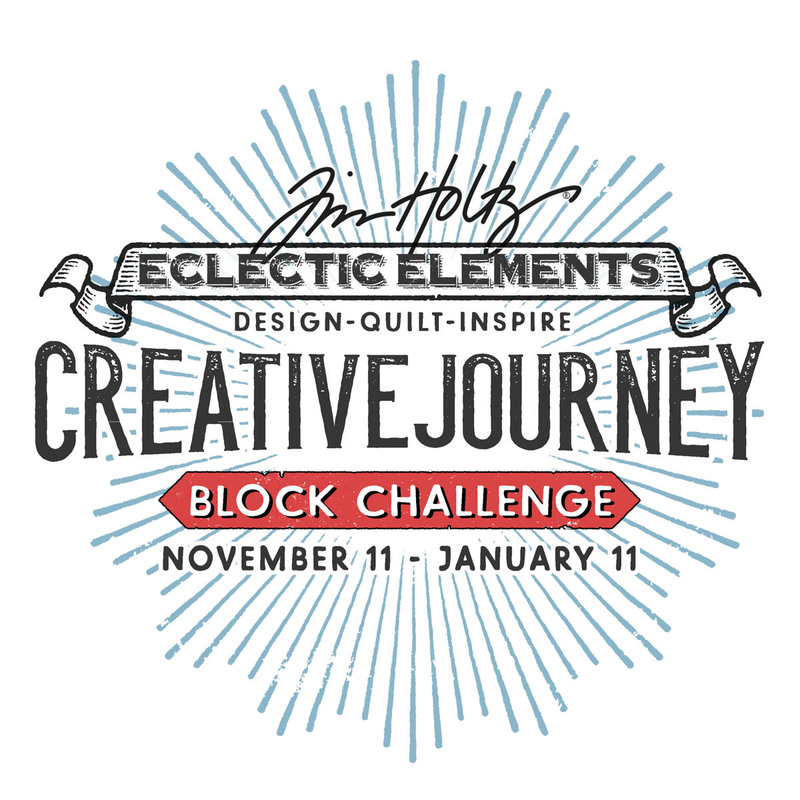 For more information about the Coats Tim Holtz Eclectic Elements Block Challenge, click here. Don’t delay. Let your creative journey inspire you and start creating today! Note: WOF—Width of Fabric, LOF—Length of Fabric. Sew the Fabric A, B, and C strips together lengthwise to make one strip unit. Crosscut (4) 3 ½” (8.89) square Rail Fence blocks from the strip unit. Sew the two top blocks together—one vertical and one horizontal. Press seam toward the vertically oriented block. Sew the two bottom blocks together in reverse order of the top row. Press in the same manner. Sew the top and bottom rows together. Trim ¼” (.64 cm) off each side of the pin cushion top, squaring up to measure 6″ x 6″ (15.24 cm x 15.24 cm). Place the pieced pin cushion top, right sides together, with the backing square. Sew ¼” (.64 cm) away from the outside edge around three sides, leaving the fourth side open. Turn right side out and insert the fiberfill. Fold the raw edges under along the open edge and sew the opening closed by hand. Thread a hand sewing needle, insert through the center of the pincushion through all layers, and sew the button on, pulling on the thread so that the front and back of the pin cushion are drawn together. Secure thread. Tim Holtz has A Gift For You! 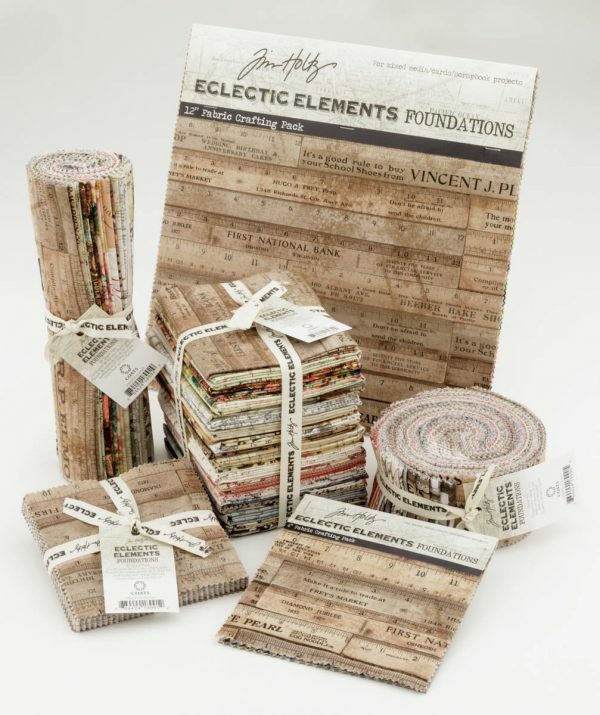 What is your favorite fabric collection from Tim Holtz? A winner will be chosen at random on January 8, 2016 and announced the following week! My favorite Tim Holtz fabric is the wallflower birds and berries. I love everything Eclectic Elements!! 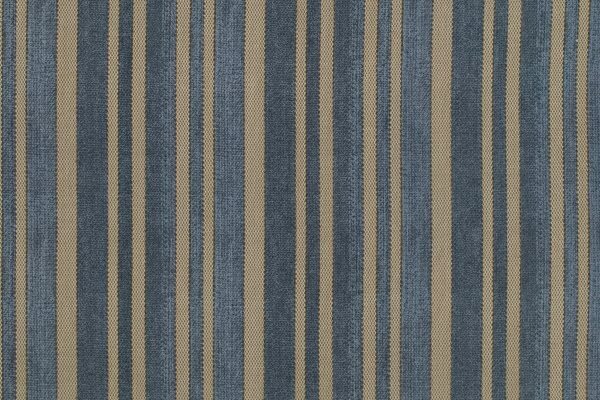 I only became aware of Tim’s fabrics with the Eclectic Elements collection. Love the Red Butterflies print from that collection! I haven’t seen any other collections, either, but I really like what I see here of Eclectic Elements. I love the Eclectic Elements line, especially the Map fabric! I fly, and it is a perfect background for airplane blocks! where does one find the collection? Tim Holtz’s fabric can be found inside Jo Ann Fabrics and Hancock Fabrics as well as independent quilt shops. You might also want to look into fabric.com, Hawthornethreads.com and Craftsy.com. Tim Holtz’s Eclectic Elements Timepieces Collection is a gem. I only know of the Eclectic Elements shown but there was also some of his fabric with roses and butterflies that I love. I love to travel and love all the travel elements of Tim’s fabric designs. My two favorites are multi botanical, and multi photo card, although it is very hard to narrow it down ! I really like his Wallflower collection. I even own some of it…love the graphic look. Eclectic Elements of course! Thanks! I really like the looks of the eclectic elements fabric. I like the pincushion tutorial also. Have always been drawn to Eclectic Elements line. Also just received a studio stash bundle that I am anxious to sew with. Wall flower collection hands down! Any of the prints with text! There are so many good ones I can’t pick a favourite! Eclectic Elements of course! Thanks for the chance to win! My favorite Tim Holtz collection is Eclectic Elements 2, especially the Music in Nuetral fabric! 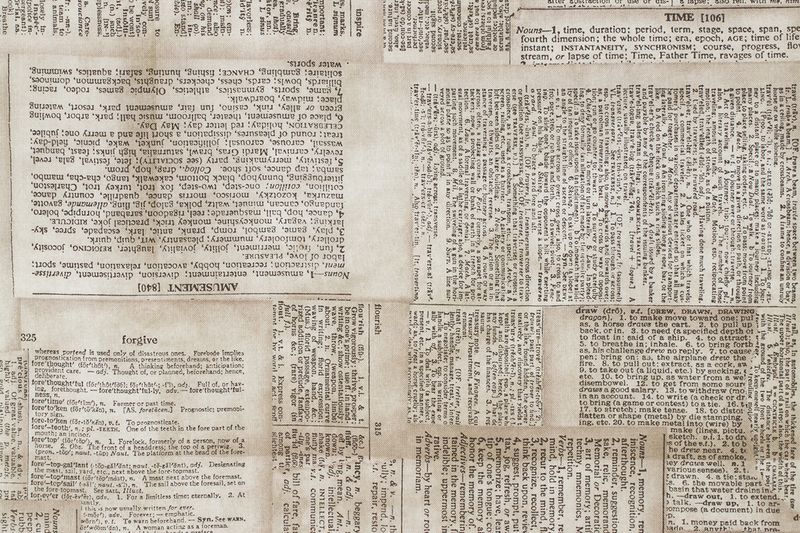 I am not to familiar with Tim Holtz fabric. I do really like this Eclectic Elements line. Thanks for the wonderful giveaway. My favorite fabric collection from Tim Holtz? I absolutely <3 the Eclectic Elements! Especially the butterflies as I love butterflies. I have been a huge Tim fan since I met him at CHA in 2005-I think it was. I also had the pleasure of demo'ing next to him & Carol Duval in 2006 in Cincinnati. He has always been a great source of inspiration in stamping and scrapbooking. Eclectic Elements, as I am not aware of other fabric lines. Loved seeing sewing inspiration on Sew4home website. He is so very talented! Thank you Tim for Wallflower Eggs and Nests. Awesome! Love this material. I am a land surveyor and maps are my thing! My favorite is birds and berries. I’m new to this… But I love the style of Electric Elements! Very eye catching! Love the Eclectic Elements fabric! Wow! This is my first introduction to Tim Holtz, and the Eclectic Elements collection is so different from fabric I would normally collect. But I like all the different collections of things. Darn, and I wasn’t going to buy any more fabric. So much for that New Year’s resolution! I’m in love with this Eclectic Elements line–Sweet!!!! I’ve used the Wallflower collection in a couple items, and I really like the Eclectic Elements too. I am drawn to words on fabric. 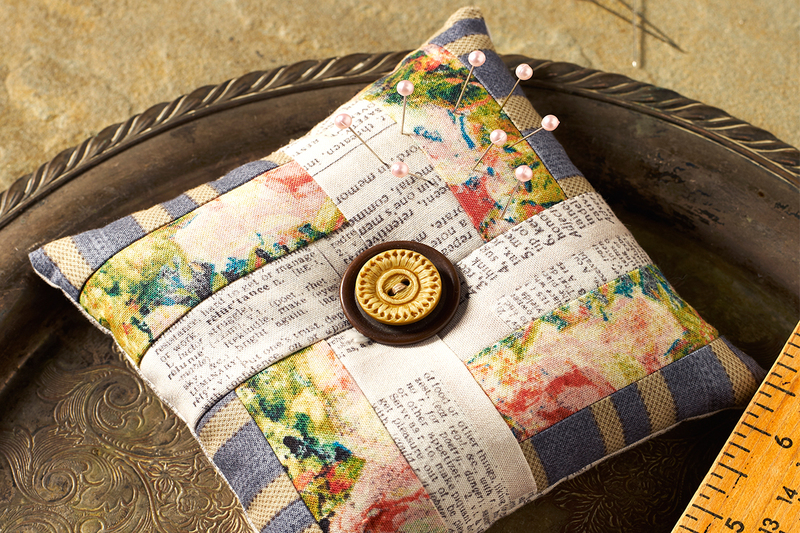 I have used Tim Holtz scrapbook supplies, now I can see many uses for his fabric! I love all of the prints in the Eclectic Elements collection, especially the wallflower shabby script & the print with the music composition. I would love to make a quilt using this collection! I’m also looking forward to making the rail fence pincushion!! My favorite is the wallflower collection. They are all really wonderful. Love the eclectic elements-multi bouquet. 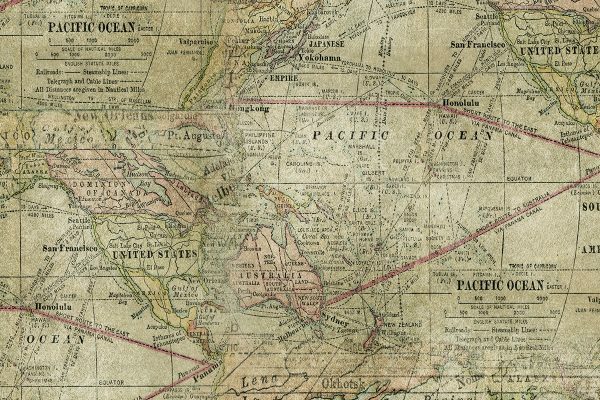 Wow, love the map and paperback pages in the eclectic range! I’m in love with Electic Elements. i love the pinks in that line. His fabric is new to me. Love the Eclectic Elements. This material is so unique. I have been quilting for a lot of years but this material inspires me like when I first started quilting. As a former scrapbooker, Tim was my favorite designer!! Now that I’ve found his fabric at a few places, it will be fun to add to my stash!! I would be thrilled to win!!! 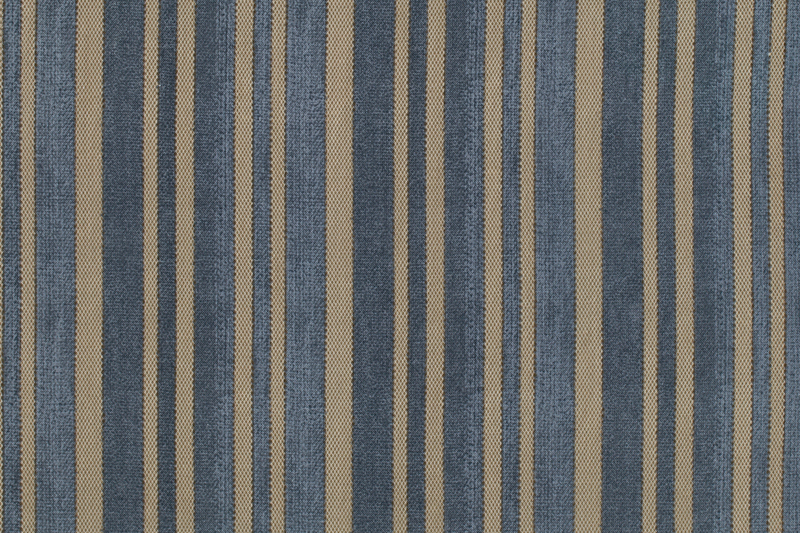 I really like Eclectec Elements as they are a masculine type of fabric and there arn’t a lot of them around. with 4 son’s and 8 grand son’s , I am always on the lookout for manly fabrics..